Romantic, Beachfront Eco Luxury, Perfect for Couples. Arenas del Mar Resort is located near the famous Manuel Antonio National Park on Costa Rica’s Central Pacific Coast. 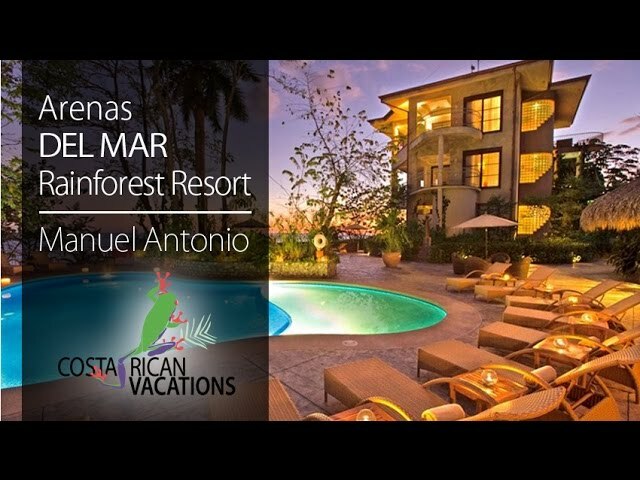 Arenas del Mar is the ideal choice for anyone looking for nature vacation packages in Costa Rica, understated sustainable luxury with direct access to two beaches, rainforest, and wildlife. This property is exceptional for travelers of all ages. The boutique resort has 38 rooms, all with plush king beds, A/C, cable TV, safe, minibar, coffeemaker, and the fabulous “Tico-Bar’, a complimentary mini bar of local snacks. Additional amenities include complimentary WiFi and free local and international calls. Your stay includes a la carte breakfast each morning in El Mirador, the resort’s main restaurant. You’ll love waking up with a fresh cup of Costa Rican coffee with a view overlooking the Pacific coast and national park. El Mirador also serves dinner, using only the freshest local ingredients. Lunch and snacks are offered at the beachfront Playitas Restaurant and Bar. Order right from your beach chair or dine under the shade of the covered open-air restaurant. Be sure to enjoy the sunset from the Mirador Bar, and don’t miss happy hour! The complimentary tortilla-making class is a hit with guests, and the included sustainability tour will fulfill your curiosity about the hotel’s green practices. On-site amenities include a small spa, gift shop, and two swimming pools, and the hotel also offers additional on-property tours such as birdwatching. Awarded with a Level 5 (highest level) Certificate of Sustainable Tourism through the Costa Rican Tourism Board, the concept behind Arenas del Mar has always been to minimize the impact on the surrounding environment while providing the most benefit to the local community through employment and growth opportunities. Of the 11 acres, only 25% is developed, which allows for plenty of untouched flora and opportunities for wildlife-spotting right on the property. Water is heated using solar panels, wastewater is cleaned and recycled for irrigation, and the whole building’s structure blends in with the surrounding forest. Rainforest view suites are available as well as private apartments featuring ocean views, a kitchenette, Jacuzzis, and large private decks. Ocean front—Arenas del Mar is the only luxury hotel directly on the beach in Manuel Antonio. Tours—Activities in the Manuel Antonio area include whitewater rafting, mangrove kayaking, ocean kayaking, sport fishing, canopy tours, horseback riding, and more! Dine—Two restaurants feature fresh local produce providing a dining experience and service that is sure to exceed guests’ expectations. Learn to make tortillas with the complimentary class! Relax your body and mind to the sound of the waves at Las Brisas Spa. Costa Rican wildlife can be observed on a private tour through Manuel Antonio National Park.